Last June, the city committed $500 million toward a plan to construct 1,000 new apartments for low-income senior citizens, but now almost a year later those plans are moving forward much slower than expected, Politico reports. 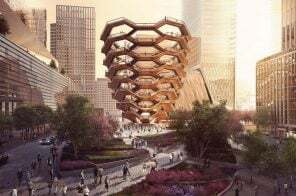 The plan had identified six potential sites—two at New York City Housing Authority properties Kingsborough Houses in Brooklyn and Morris Houses in the Bronx, and four on other city-owned lots—but so far the city has only requested developer proposals for one of those sites. Applications are now being accepted for 43 affordable senior housing apartments in the Foxhurst neighborhood of the Bronx. Formerly home to the Home Street Presbyterian Church, the new residential building at 1017 Home Street offers amenities like an on-site super, lounge, fitness center, bike room, a roof terrace, and card-operated laundry. Available studio and one-bedroom apartments are set aside for seniors who are 62 years or older and who earn a maximum of $41,750 per year. Eligible residents pay 30 percent of their income and must qualify for Section 8. 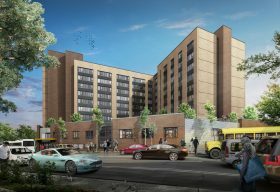 A lottery launched this week for 58 affordable units of senior housing in the West Farms neighborhood of the Bronx. Located at 1880 Boston Road, the development contains 167 affordable apartments with amenities including a yoga room, community room, art studio, library, and a rooftop terrace. 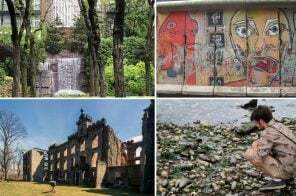 The building is just a few blocks south of the Bronx Zoo and sits next to the Bronx River. Available studio and one-bedroom apartments are set aside for seniors who are 62 years or older and who earn a maximum of $31,750 annually. Each eligible resident pays 30 percent of their income and will need to qualify for Section 8. 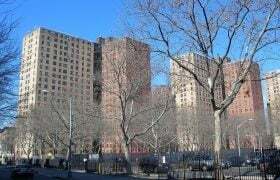 As part of the new city budget, New York City has committed $500 million toward a plan to construct thousands of new apartments for low-income senior citizens on vacant public housing land, the Wall Street Journal reports. The new units would also free up existing NYCHA units currently occupied by seniors for people currently on wait lists for housing. Just a few weeks ago, 6sqft reported that starchitect Daniel Libeskind‘s first New York City building to rise from the ground up would be a 197-unit affordable senior housing project planned for Site 2 of the Sumner Houses in Bed-Stuy. 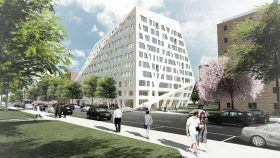 Now Studio Libeskind has released three new renderings of the 10-story building-to-be, showing more of its an angular white-colored facade done in the firm’s signature un-orthogonal style (h/t Dezeen). Though he has called New York home for decades, noted Polish-American architect Daniel Libeskind has yet to see a NYC building to completion. 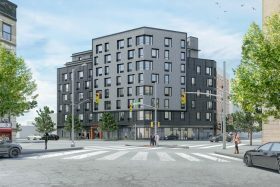 But it appears that may soon change, as CityRealty reports that his first ground-up building will be a 197-unit affordable housing project on Site 2 of the Sumner Houses in Bed-Stuy. 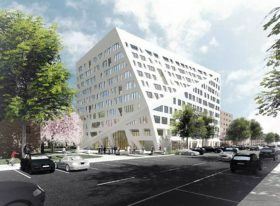 A January press release announcing the selection of the project’s developers credits Studio Daniel Libeskind as the designer of the 10-story building-to-be, and a rendering shows an angular white-colored building done in the firm’s signature un-orthogonal style. 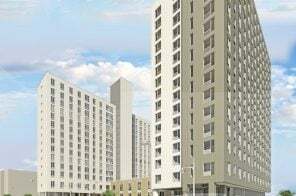 New York City Seniors now have more options in the five boroughs as the lottery launches today for Staten Island’s Seaview Site C, comprised of 160 newly-constructed units at 155-175 Friendship Lane in the Todt Hill neighborhood. The Douglaston Development project is exclusively for low-income senior citizens and consists of 82 studios, 78 one-bedroom apartments, and a resident manager’s unit. Amenities include an indoor common area, outdoor patio, laundry room, and on-site parking. 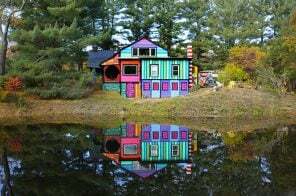 Proposed site; Image via Google Maps. 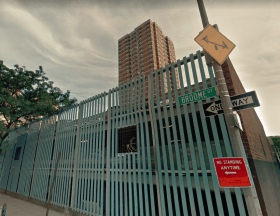 Housing organization Grand Street Guild has announced plans to build two 15-story towers as part of a 100 percent affordable housing project that will bring 400 new apartments–including over 150 reserved for seniors–to the Lower East Side. The not-for-profit group, which was formed by the Archdiocese of New York, is the owner of the 26-story Grand Street Guild towers, built in 1973 and home to over 1,500 residents, that surround St. Mary’s Church on Grand Street. According to The Lo-Down, one of the proposed sites for the new towers is the corner of Broome and Clinton streets (now a parking garage) and another is 151 Broome Street, currently housing the Little Star Daycare Center.